Oliver et al. have just published an impressive paper dealing with re-located type material of Colonel George Montagu (1753-1815). “A complete list of new molluscan taxa introduced by Col. George Montagu (1753–1815) is presented. The available type material of these taxa are itemised and illustrated. The majority are present in the Royal Albert Memorial Museum & Art Gallery, Exeter with a smaller number in the Natural History Museum, London. The historic background of both collections is reviewed with special reference to the many non-British species spuriously introduced into Testacea Britannica and its Supplement”. I know that locating historical collections doesn’t sound like rocket-science. but in our discipline where ‘every name counts’ it is really very helpful to have type material from our deceased colleagues available for study. And, of course, the further back in time the more difficult it becomes to locate this material and track its provenance. In the paper also some Neotropical material turned up, quite unexpected for someone who worked on ‘Testacea Britannica’ (i.c. British shells)! Finally, it’s worth repeating here the last lines of their paper: “It is sad to report that those with a knowledge of historic conchology are diminising in numbers and that curatorial expertise throughout the museum sector is threatening the value and access of many collections”. This entry was posted in Uncategorized and tagged bulimulidae, historical collections, literature, types on November 17, 2017 by bramb. Baja California is an area with a rather scarce land snail fauna, and limited focussed papers in literature. Clark & Salisbury (2016) report on a small collection made during a biodiversity survey inside the Sierra La Laguna Biosphere Reserve, where a new gold mine is being planned. The snails reported are already known from other localities on the penisula, viz. Naesiotus rimatus (Pfeiffer, 1847), N. spirifer (Gabb, 1868), and Rabdotus sufflatus (Gould in Binney, 1859). A new record is a as yet unidentified Succinea species, which was only collected as dead shell material. Clark, W.H. & Salisbury, R., 2016. 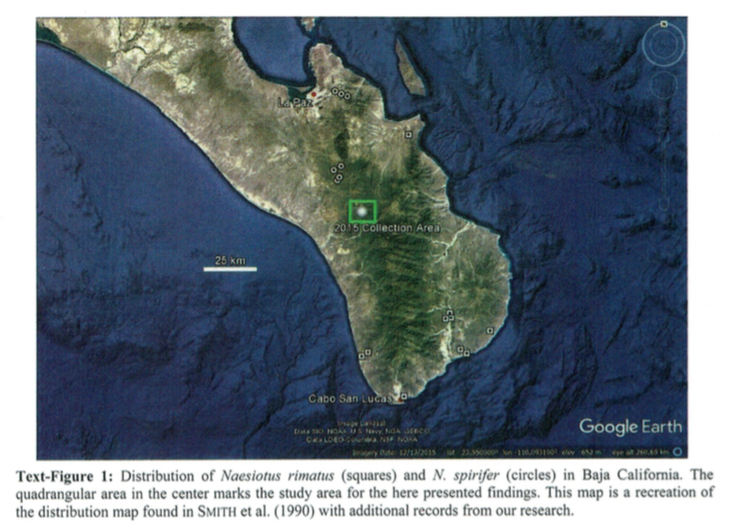 New land snail records for Baja California Sur, Mexico. –Conchylia, 47 (3-4): 59-64. This entry was posted in Uncategorized and tagged bulimulidae, literature, mexico, succineidae on March 7, 2017 by bramb. The following report was found on Facebook, with land snails data from NE Venezuela, a region for which hardly reliable data exist in literature. 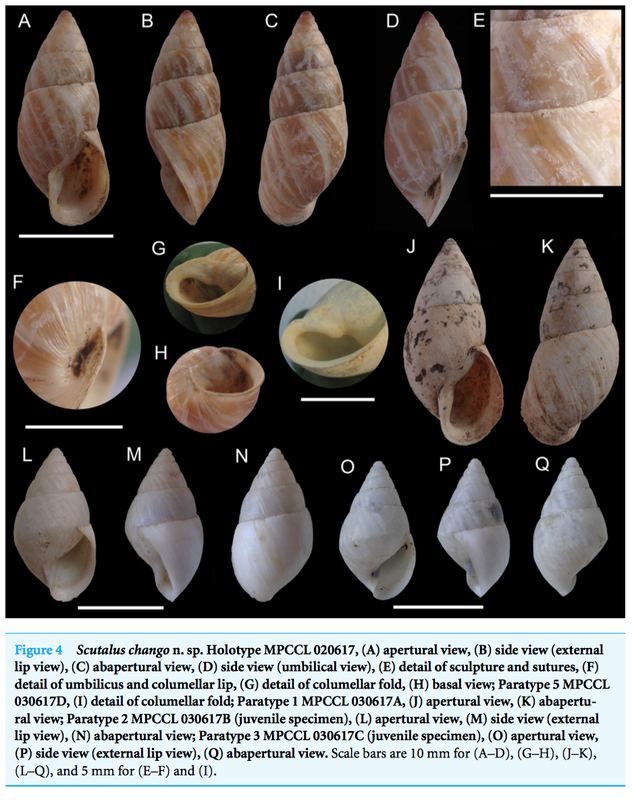 … NEW UPDATING DATA ( III ) — ABOUT RECENT AND SUB-FOSSIL CONTINENTAL SNAILS (MOLLUSCA: GASTROPODA: CAENOGASTROPODA & PULMONATA) OF ARAYA PARISH, SUCRE STATE, NORTHEASTERN VENEZUELA, SOUTHERN CARIBBEAN REGION: A “PRELIMINARY” FIELD BALANCE ! Total of seventeen (17) verified species (thirteen (13) terrestrial — two (2) non-native/ exotic — and four (4) freshwater forms — one non-native/ exotic), found in “xerophytic environments” of the parish until “December 2016”, distributed in fourteen (14) genus and nine (9) families. Important to highlight that, in addition to the three (3) other specifically native aquatic/ limnic forms, all the thirteen (13) native terrestrial species so far detected in the region “contradictorily” correspond to own forms of environments/ humid forest ecosystems ………. The adjective ‘native’ which is used here, should be considered with care. E.g., the Subulinid and Achatinid species have been introduced, and also Drymaeus multilineatus has probably been introduced in the past. The list contains thus several species which originate from elsewhere, which is no big surprise as the locality is at the coast. Apart from some minor errors (Bulimulus and Drymaeus belong to the family Bulimulidae; Oxystyla should be Orthalicus, abducta = obductus), this is information from a country with comparably hardly good information in the malacological literature. This entry was posted in Uncategorized and tagged achatinidae, bulimulidae, neocyclotidae, odontostomidae, orthalicidae, subulinidae, venezuela on December 6, 2016 by bramb. Papers on Neotropical fossils are rare, but Sergio Miquel is a regular contributor of them. Although Turazzini & Miquel (2014) was overlooked by me, I mention the paper now it came to my attention. The abstract follows after the break. “Numerous fossil gastropods have been recorded in an edaphic level of the middle section of the the Aisol Formation (Mendoza Province, Argentina). This stratigraphic section bears an association of fossil mammals suggesting an early Pliocene age (possible Montehermosan SALMA). 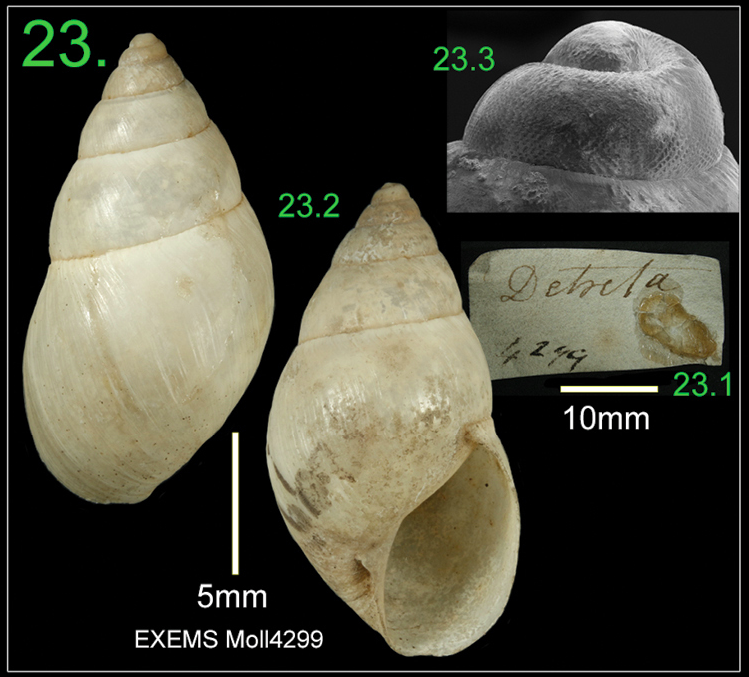 Up to four taxa of gastropods have been identified, belonging in Succinea Draparnaud (Succineidae), Gastrocopta Wollaston (Vertiginidae), Bostryx Troschel (Bulimulidae), and a new species of Radiodiscus Pilsbry and Ferriss (Charopidae). The fossil record of terrestrial pulmonate mollusks in Argentina is scarce and mainly restricted to the Quaternary. Thus, the record of these taxa is of paramount importance because it constitutes the oldest record of Gastrocopta and Succinea in Argentina, the first record of Bostryx in Mendoza Province, and the first record of the family Charopidae (Radiodiscus sanrafaelensis nov. sp.) in Pliocene deposits of Argentina”. Turazzini, G.F. & Miquel, S.E., 2014. 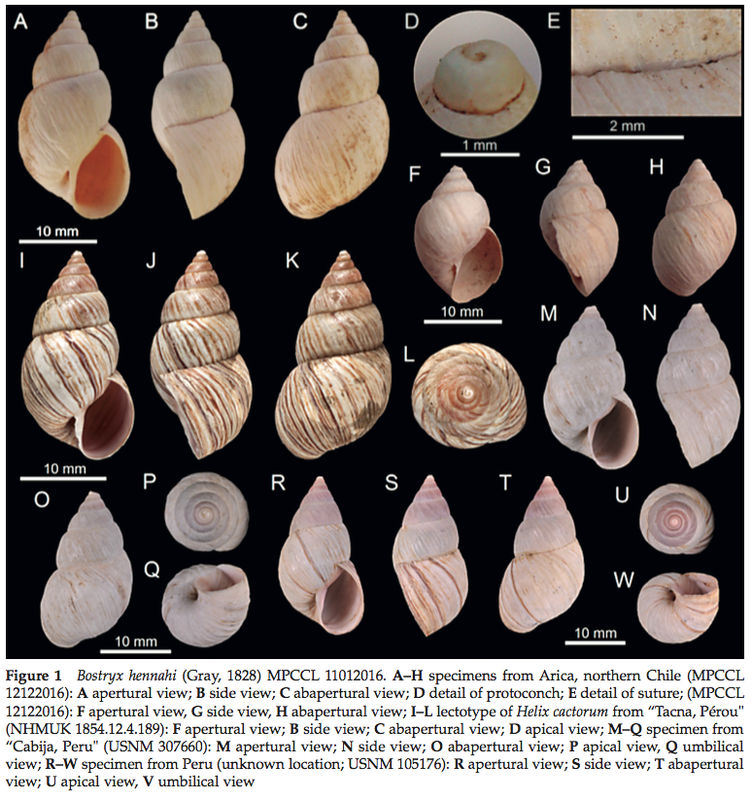 A terrestrial gastropod community from the Early Pliocene (Neogene) of Mendoza, Argentina, with description of a new species of Radiodiscus Pilsbry and Ferriss, 1906 (Mollusca: Pulmonata: Charopidae). – Ameghiniana, 51(5): 396-404. This entry was posted in Uncategorized and tagged argentina, bulimulidae, charopidae, fossil, Gastrocoptidae, literature, Pliocene, succineidae on October 26, 2016 by bramb.